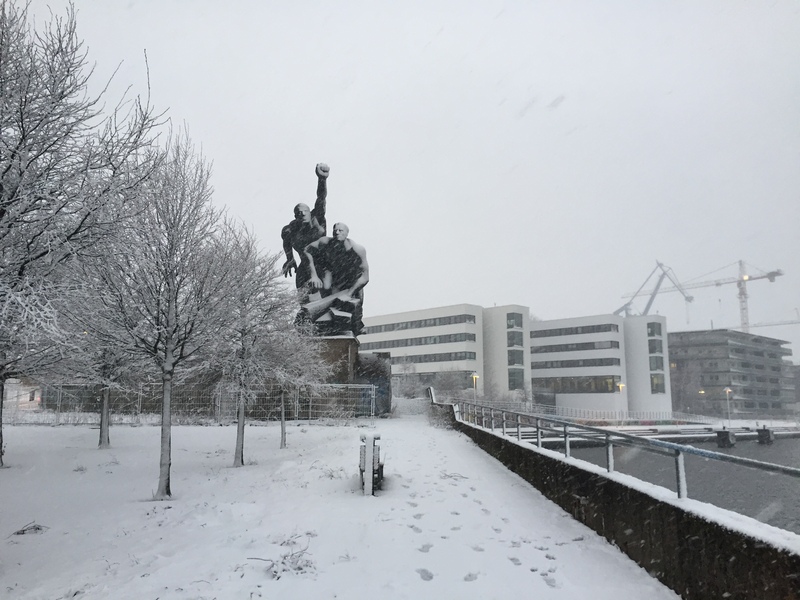 Only fifteen minutes walk from the Rostock city harbour lies one of the most impressive revolutionary monuments in Germany. 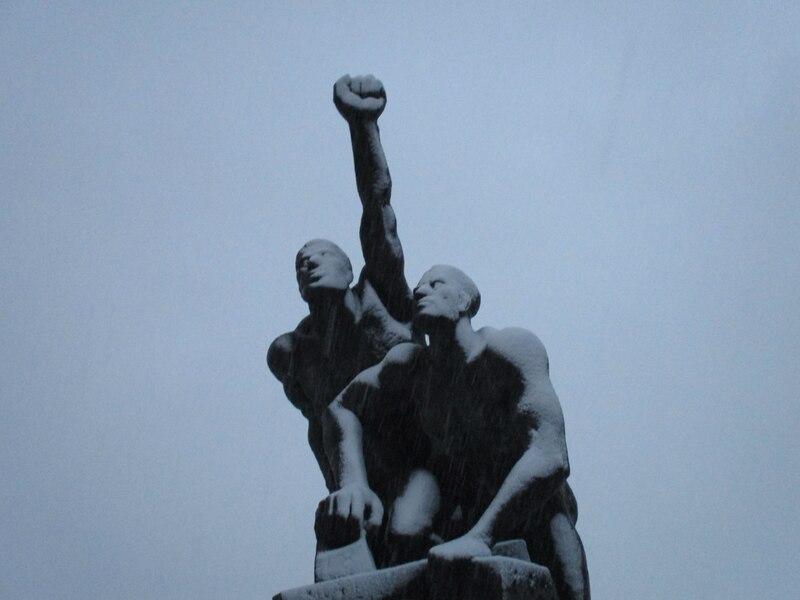 It’s the „memorial of revolutionary sailors“ erected in honour of the 1918-November Revolution. The sailors‘ uprising in Kiel was the beginning of the revolution that led to the fall of the monarchy in the German Reich and the foundation of a parliamentary democracy („Weimar Republic“). 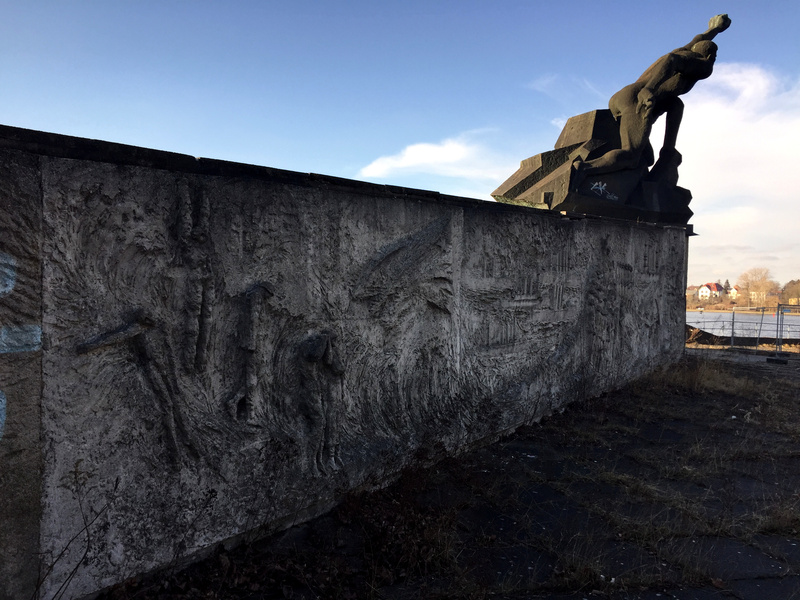 Rostock’s monument consists of two parts: a twenty-metre-long relief wall with scenes of the international labour movement and a nine-metre-high bronze sculpture of two sailors in attacking position. 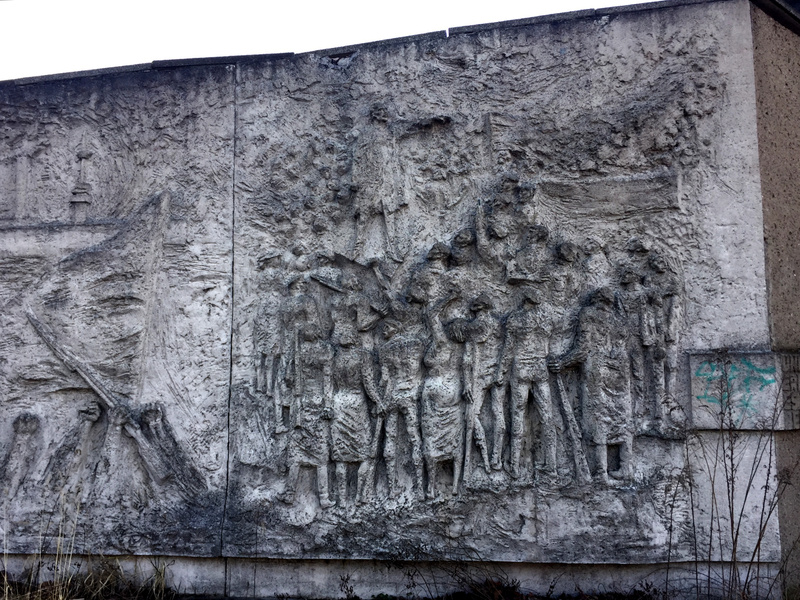 Already in 1970, the complex was inaugurated with the relief wall designed by Reinhard Dietrich and an exhibition room. In 1977, the memorial was expanded with the monumental sculpture by Wolfgang Eckhardt and Reinhard Dietrich. 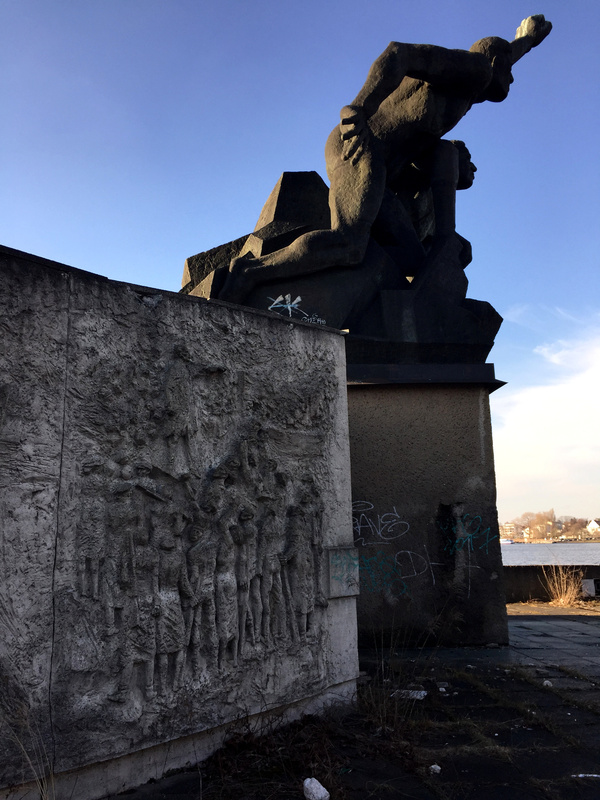 In GDR times political events took place regularly at the memorial, above all celebrations of the German-Soviet friendship and commemorations of the November Revolution. 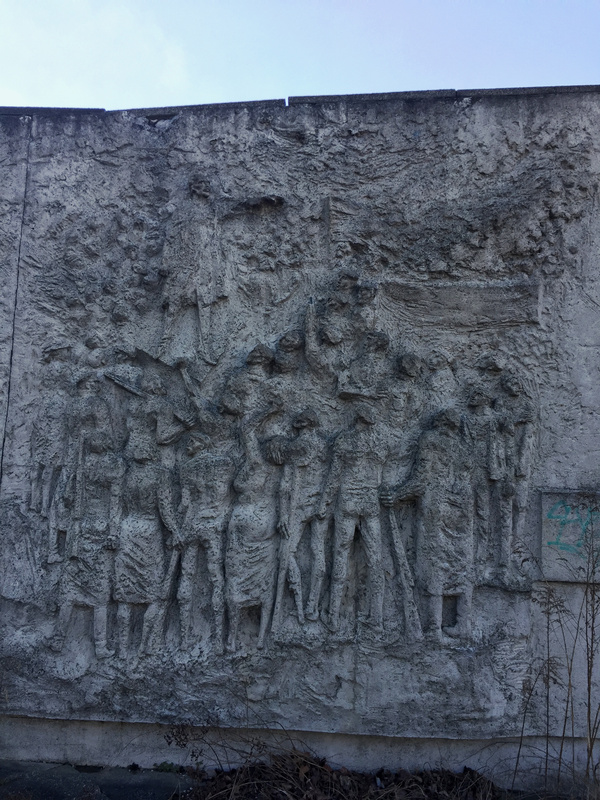 The twenty-metre-long relief wall depicts five scenes of the international labour movement that draw attention to the historical context of the Kiel Sailors‘ Uprising and establish a causal relationship: The German revolution can only be understood in the context of international resistance by workers. The last picture on the wall has Lenin as its main character. The leader of the Russian Revolution of 1917 stands in orator pose with his left arm outstretched in front of an armed crowd cheering him. 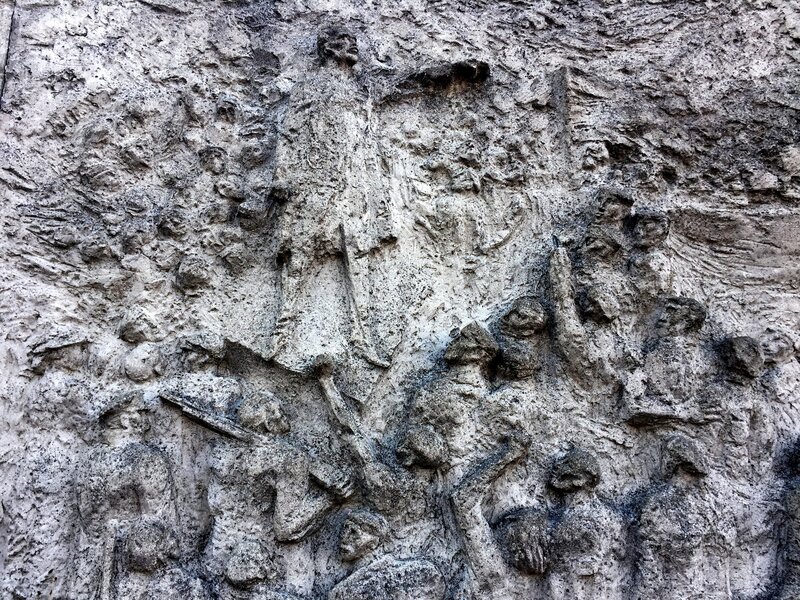 This representation shows many similarities to the Lenin-relief in Großenhain, which was inaugurated in 1971. 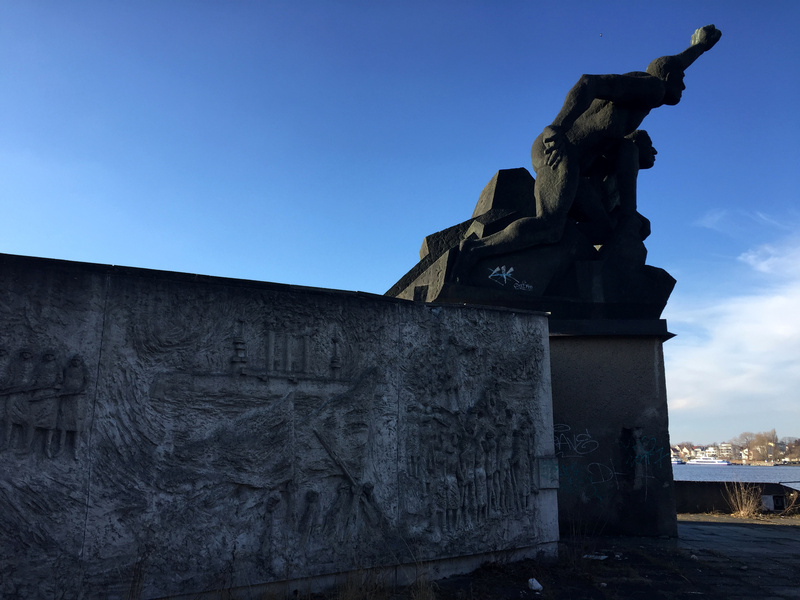 Not only the figure of Lenin, but the whole monument is currently in a poor state of preservation, but it is planed to be completely renovated by spring 2019. The entire surrounding area will also be renewed in order to create a beautiful promenade and a green area. 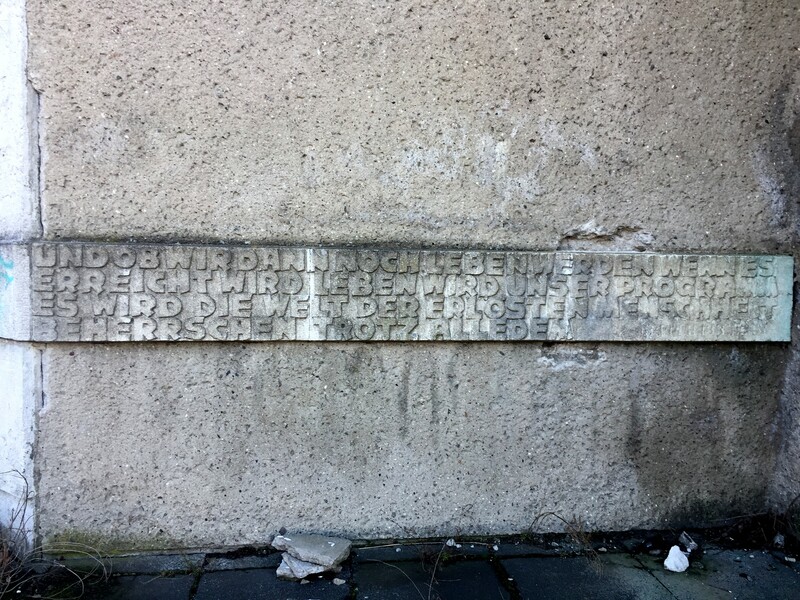 Nur fünfzehn Minuten Fußweg vom Rostocker Stadthafen entfernt steht eines der imposantesten revolutionären Denkmäler Deutschlands. 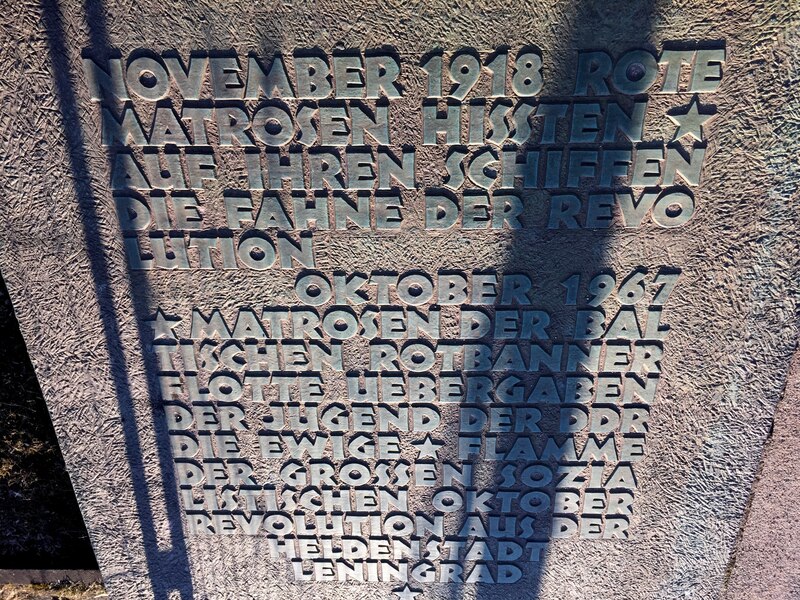 Es handelt sich um die in Erinnerung an die Novemberrevolution von 1918 errichtete „Gedenkstätte revolutionärer Matrosen“. Der Kieler Matrosenaufstand hatte damals die Revolution ausgelöst, die zum Sturz der Monarchie im Deutschen Reich und der Gründung einer parlamentarischen Demokratie („Weimarer Republik“) führte. Das Denkmal besteht aus zwei Teilen: eine zwanzig Meter lange Reliefwand mit Szenen der internationalen Arbeiterbewegung und eine neun Meter hohe Bronzeskulptur zweier Matrosen in Angriffsposition. Bereits 1970 wurde die Anlage nur mit der von Reinhard Dietrich gestalteten Reliefwand sowie einem Ausstellungsraum im Inneren des Baus eingeweiht. Davor wurde eine aus Leningrad eingefahrene „ewige Flamme“ angebracht. 1977 erweiterte man die Gedenkstätte um die monumentale Plastik von Wolfgang Eckhardt und Reinhard Dietrich. 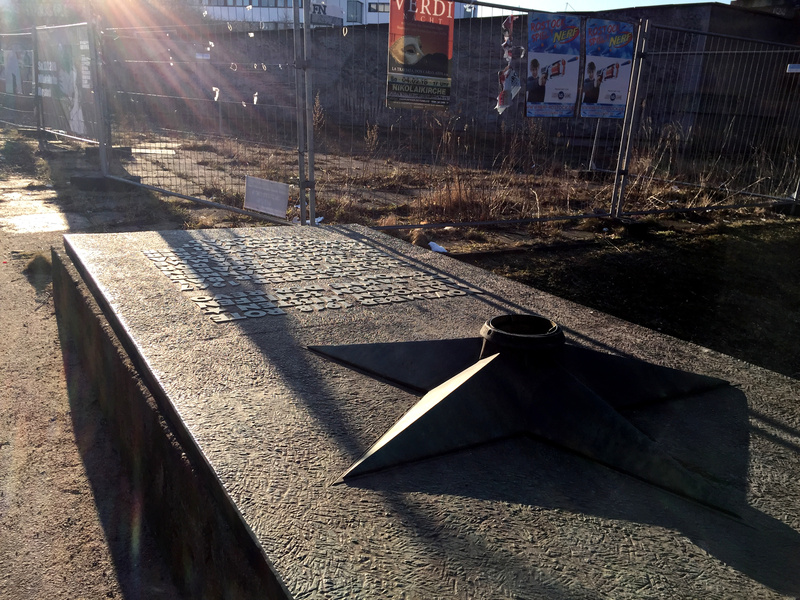 Am Denkmal fanden zu DDR-Zeiten regelmäßig politische Veranstaltungen statt, z.B. um die deutsch-sowjetische Freundschaft zu feiern oder der Novemberrevolution zu gedenken. In der zwanzig Meter langen Reliefwand sind fünf Szenen der internationalen Arbeiterbewegung dargestellt, die auf den historischen Kontext des Kieler Matrosenaufstands aufmerksam machen und eine kausale Beziehung herstellen: Auch die deutsche Revolution kann nur im Rahmen des internationalen Arbeiterwiderstands verstanden werden. Das letzte Bild der Wand hat Lenin als Hauptfigur. Der Anführer der Russischen Revolution 1917 steht in Rednerpose mit ausgestrecktem linkem Arm vor einer bewaffneten Menschenmenge, die ihn bejubelt. Diese Darstellung weist viele Ähnlichkeiten zum 1971 eingeweihten Großenhainer Lenin-Relief auf. Nicht nur die Figur Lenins, sondern auch das gesamte Denkmal befinden sich zurzeit in einem schlechten Erhaltungszustand. Bis zum Frühjahr 2019 soll die Anlage jedoch komplett saniert werden. Auch die Umgebung wird erneuert, um hier eine schöne Uferpromenade samt Grünanlage entstehen zu lassen.